Fort Atkinson One-Way Study - TADI - Traffic Analysis & Design, INC. Fort Atkinson One-Way Study - TADI - Traffic Analysis & Design, INC.
TADI's Role: To compare one-way and two-way traffic flow patterns plus provide ideas for maximizing parking on the study streets. The City of Fort Atkinson would like to increase parking near the Creamery building in downtown Fort Atkinson. On-street parking spaces could be created on nearby Mechanic Street if the travel lanes on Mechanic Street and connecting N. Water Street were narrowed up by one-way only operation. This technical memorandum evaluates the traffic impacts at adjacent intersections between the existing two-way operation, one-way westbound/northbound operation, and one-way southbound/eastbound operation. The City of Fort Atkinson prepared a parking layout sketch for the one-way westbound/ northbound traffic system. TADI reviewed this plan and provided comments and recommendations for further consideration with regards to the number of spaces provided, positioning, traffic flow, and vehicle-parking conflicts. 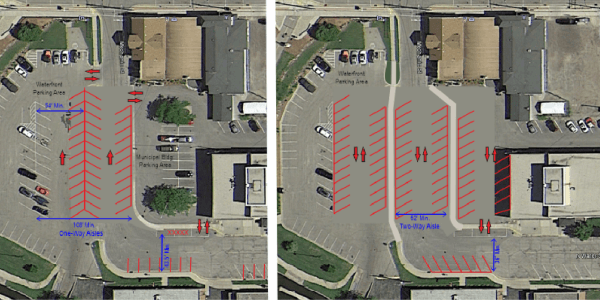 TADI also prepared two parking layout alternatives (one is shown above) for consideration by the City in order to maximize parking spaces within the available space.